We are women. We are different. On the outside, we are warm, strong and nurturing. On the inside, however, we are relentless when holding a grudge and quick to use it to our advantage if the need calls. Though we may seem cheerful, our layers of anguish go far beyond those any man can begin to imagine. We are cursed but always fight back. We are fragile, but never weaker. We hold our own private hell internally and only let it unleash when we are wronged. And you better make sure you aren't the one in our path. 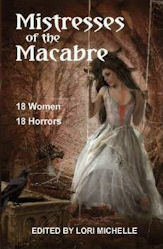 Eighteen tantalizing tales of terror that are sure to ensnare you. Stories from Diane Arrelle, Alanna Belak, Chantal Boudreau, Nadia Boulberhane, Mandy DeGeit, Magnolia Erdelac, Erin Eveland, Lindsey Beth Goddard, Nikki Hopeman, Hollis Jay, Charlotte Jones, Suzie Lockhart, Dawn Napier, Amanda Nethers, Joanna Parypinski, Suzanne Robb, Kelli A. Wilkins, and Melissa Clare Wright. You will become tangled in our woven web of storytelling. We are different. We are women.